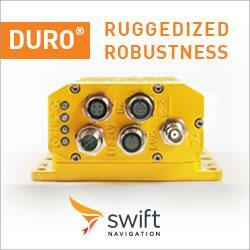 Duro® is a ruggedized version of Swift Navigation's Piksi® Multi RTK GNSS receiver. Built to be tough, Duro is designed for easy integration into existing equipment. This affordable, easy-to-deploy GNSS sensor delivers robust, centimeter-accurate positioning while protected against weather, moisture, vibration, dust, water immersion and the unexpected that can occur in outdoor long-term deployments.